Two Sarlink thermoplastic vulcanizate (TPV) elastomers provide the first practical alternative to EPDM foam or sponge in automotive seals, construction weatherstripping, gaskets, and other profiles requiring high resilience for seal integrity, it was announced today by Teknor Apex Company, which will introduce the compounds at FAKUMA 2011 (Stand B4-4107). 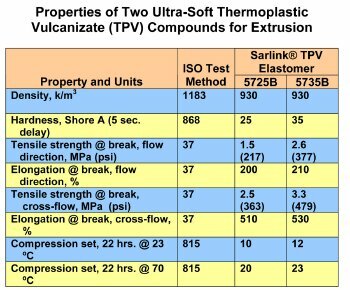 With Shore A hardness levels of 25 and 35, respectively, Sarlink 5725B and 5735B are the softest TPVs available for extrusion and exhibit the lowest compression set, thus providing outstanding elasticity similar to that of EPDM foam. Yet, unlike EPDM, the Sarlink compounds are thermoplastics, and as such they offer processing advantages that enable manufacturers of automotive sealing systems and building and construction profiles to reduce costs and achieve higher productivity. "The fundamental processing advantages of TPVs over EPDM and other thermoset rubbers include simpler and less costly equipment, elimination of the curing step, faster throughput, and recyclability," said Ger Vroomen, senior European automotive market manager for TPEs. "In addition, TPVs can be co-extruded with stiff polyolefins for rigidity or attachment requirements or for complex sealing structures, whereas EPDM requires the costly step of encapsulating metal." Like other compounds in the Sarlink 5700 Series, Sarlink 5725B and 5735B are formulated for high levels of UV resistance and improved fogging properties. Details on physical properties appear in the accompanying table. All Sarlink TPV compounds consist of dynamically vulcanized rubber in a polypropylene matrix, combining the feel and elasticity of rubber with the processing ease of thermoplastics. The Thermoplastic Elastomer Division of Teknor Apex Company is the most diversified manufacturer of TPEs, offering broad product families based on six generically distinct polyolefin, styrenic, and vulcanizate chemistries. Headquartered in Pawtucket, Rhode Island, U.S.A., the division compounds TPEs at eight locations in the U.S., Europe, and Asia and is an international supplier to the appliance, automotive, construction, medical-device, wire and cable, and other consumer and industrial product industries. Other plastics businesses of Teknor Apex include the Bioplastics, Nylon, Specialty Compounding, and Vinyl Divisions and Teknor Color Company. .